With SDCC around the corner, there have been a lot of announcements lately, but none that I'm more excited about than this! I will be launching a brand new ongoing series called ROYAL CITY. It will be published monthly by IMAGE COMICS and it will be the first monthly book that I've both written and drawn since Trillium and Sweet Tooth! 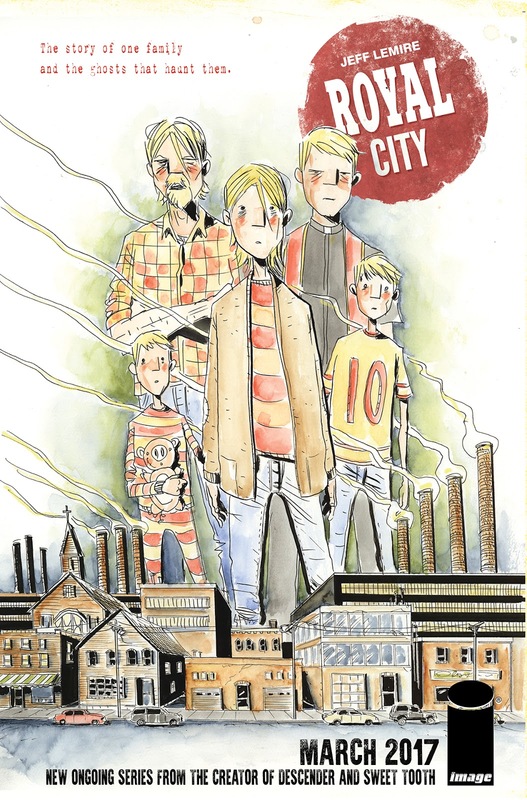 Image Comics is pleased to announce ROYAL CITY—a new ongoing monthly series written and illustrated by New York Times bestselling author Jeff Lemire (DESCENDER, Sweet Tooth) and set to launch in March 2017. ROYAL CITY promises to be a sprawling, serialized graphic novel that will chart the lives, loves and losses of a troubled family and a vanishing town, across three decades. ROYAL CITY follows Patrick Pike, a fading literary star who reluctantly returns to the once-thriving factory town where he grew up and is quickly drawn back into the dramas of his two adult siblings, his overbearing Mother and his brow beaten Father, all of whom are still haunted by different versions of his youngest brother, Tommy, who drowned decades ago. ROYAL CITY is a return to the literary and thematic territory of Lemire’s breakthrough graphic novel Essex County and is his most ambitious, and most personal project to date. Read the first interview about Royal City here at ENTERTAINMENT WEEKLY! Waypoint Entertainment has acquired the rights to author Jeff Lemire and illustrator Emi Lenox’s comic series Plutona, a coming-of-age story which centers on a group of kids who find the body of a famous dead superhero in the woods. The move comes right before the start of Comic-Con which starts in earnest next week on July 20th in San Diego. Image Comics released Plutona, a 5-issue limited series, in September last year. Waypoint Entertainment’s Ken Kao (The Nice Guys) will produce the project with partner Dan Kao and Addictive Pictures’ Russell Ackerman (Mama) and John Schoenfelder under their first-look deal. 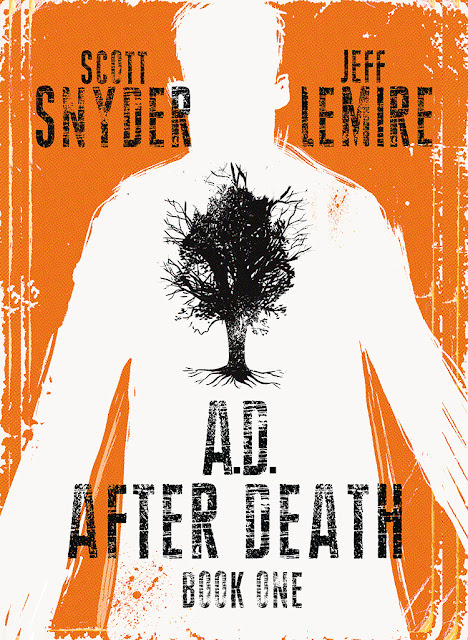 “Plutona has been a labor of love for us and we were very careful about finding a home for it, and we are thrilled that the team at Addictive and Waypoint share our passion for the story and for its potential as a film,” said Lemire, who is also the author of titles including the Essex County Trilogy, Sweet Tooth, The Nobody, and wrote a run of Animal Man. 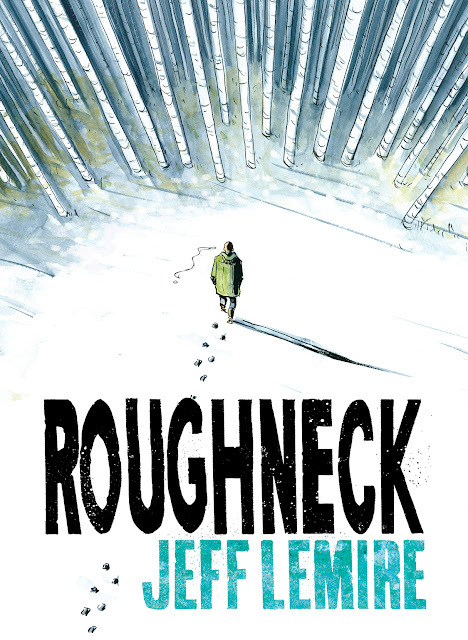 Lemire is known for his moody, humanistic stories and sketchy, cinematic, black-and-white art and has worked extensively with DC and Marvel Comics. Lenox is perhaps best known for her diary comic Emitown, as well as having work featured in such critically-acclaimed series as Nowhere Men, Madman, Glory, and Sweet Tooth. Waypoint Entertainment is the same company that acquired the rights to two Mark Millar properties, American Jesus and Supercrooks, which Ken Kao will produce with partner Dan Kao and Addictive Pictures. They are also in pre-production on the sci-fi thriller Tau, directed by Federico D’ Alessandro and starring Maika Monroe and Ed Skrein. Addictive Pictures is currently prepping Jeremy Saulnier’s next film Hold the Darkfor A24, and recently closed a deal for Deeper written by Max Landis starring Bradley Cooper at MGM.